These days, it’s hard to keep track of all the new buzzy, nutrient-rich superfoods. Luckily for you, we’re taking diligent notes to keep you informed. It’s now goji berries’ time to shine in the health world, and boy do they have some insane benefits. Apparently, they have even been used as a food and medicine in Asia for at least 2000 years (and for good reason). From antioxidants to vitamin C to protein, these tiny powerhouses have a lot to offer us. Who knew something so small could be so powerful? We got in touch with some nutrition experts and had them weigh in on the benefits of goji berries and how we can incorporate them into our diets. Whether you’re mixing them into your morning smoothie, steeping them in your tea, or eating them plain, keep scrolling to read more about goji berries and all of their perks. According to The Nue Co.'s Tiffany Lester, MD, advisor and medical director of Parsley Health, “Goji berries are powerhouses containing four grams of protein in just 1/4 cup.” Clara Norfleet RD, LDN, adds that since goji berries are "a complete protein containing all eight of the essential amino acids, they are a great choice for vegetarians or vegans.” Protein also keeps you full longer, warding off any unnecessary (and unhealthy) snacking throughout the day. These tiny superfoods “contain potent antioxidants that have been shown to help ward off damaging free radicals in the body,” says Simpson. 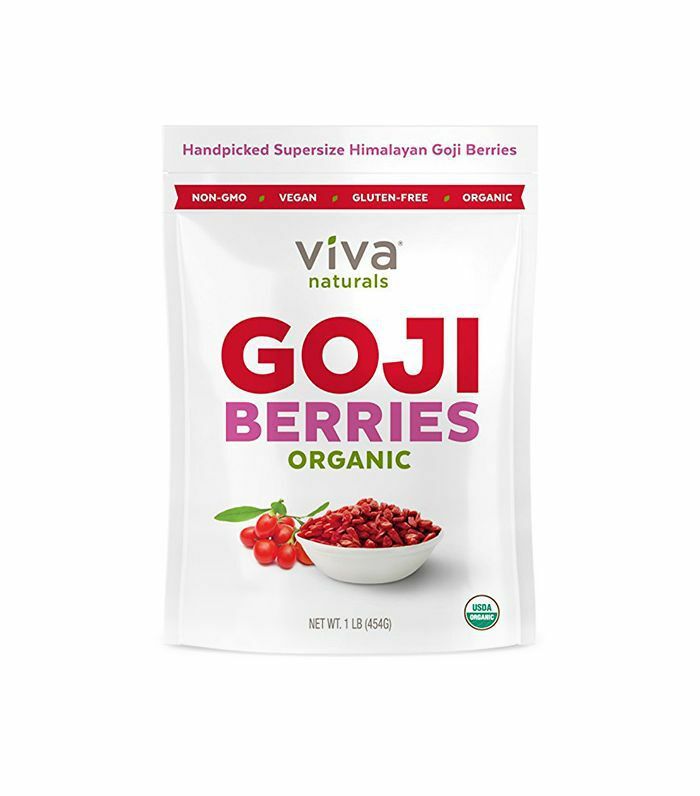 Goji berries also contain carotenoid and lutein and are believed to be one of the richest sources of zeaxanthin, an important antioxidant that protects the eyes and skin from environmental aggressors, a huge factor that contributes to aging. The antioxidants in goji berries also decrease our risk for serious health conditions like heart disease, cancer, and neurologic diseases. They are also a “great source of betacarotene, which is converted to vitamin A to support healthy skin, eyes, and immune system,” says Norfleet. According to experts, there are numerous ways to incorporate goji berries into our diets. Adding them to your morning (or afternoon) smoothie is a good way of getting all the antioxidants, fiber, and protein that the berries have to offer. Simpson suggests soaking fresh goji berries for five to 10 minutes first to soften and improve the bioavailability of nutrients. She also suggests adding them to trail mix or even tea, by steeping the berries in water for 10 minutes. Lester’s favorite way to integrate goji berries into her diet is by adding a teaspoon of The Nue Co.'s Energy Food supplement ($75) to warm water in the morning. More of a cold-pressed juice gal? Norfleet adds that Suja Juice is launching a new melon-based flavor that contains goji berries and fermented ginger. Next, check out 8 immune-boosting smoothies we want to sip all day!